To install this template on your Blogger blog, login to your Blogger account and go to > Design > Edit HTML. Backup your Blogger current Blogger template by click "Download Full Template". Choose and upload XML template of social eyes from you hard drive. You need to make some changes in its menu feature. Just replace URL and anchor text with your own. This is the code that you have to edit for top navigation menu. Now, your installation is complete! If you have any problem regarding Social Eyes Blogger Template then feel free to ask me via comment below. 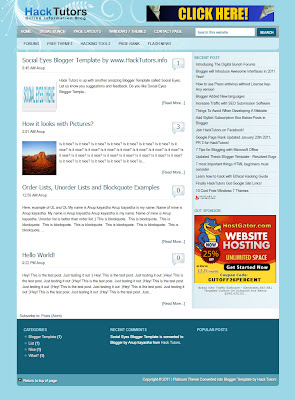 Let me know you suggestion and feedback about Social Eyes Blogger Template. Please note that this template is converted from WordPress theme from StudioPress.